"Who's the man? I'm da man. Woohoo. Awright now. Lookin' fine." Sorry, did I think that out loud? Note to self: Positive self talk is a good thing. Talking to ones self is not. Okay, now, Mary, it's time to break in song! "For he's a jolly good fellow! For he's a jolly good fellow! For he's a jelly good felll el oh... you gotta bake 'im a pie!" To "Atta Boy! ", Mary is taking me out to dinner tonight! A pie would be great, but she suggested Rovezzi's. Rovezzi's is a good alternative. 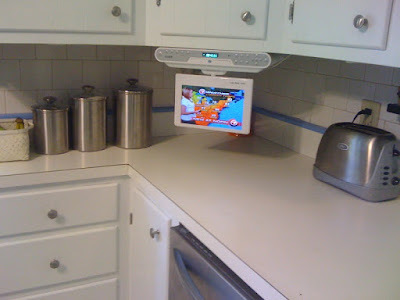 'Keeps the kitchen cool and leaves time to watch the new TV together over a cupa. In our house, at our age, the two most important things in the kitchen are the TV and the microwave. Getting a TV installed in the kitchen is just another little milestone along your circular path of life. And the fact that you installed it yourself...priceless.